ReelzChannel, TV About Movies, announced that all six seasons of the three-time Emmy Award® winning satirical sitcom The Larry Sanders Show will air on REELZ, premiering Monday, March 4 at 1pm ET/10am PT. New episodes will air back-to-back Monday-Thursday in one hour comedy blocks at 1pm ET/10am PT and again at 2am ET/11pm PT. 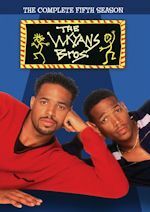 It will replace an hour of Spin City at 1pm ET/10am PT. What will the rest of the schedule look like? 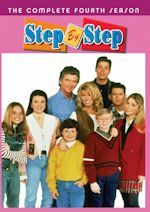 We will let you know very soon, but right now among the comedies that air on Reelz are Wings, Becker and Spin City, as Cheers, 3rd Rock from the Sun and Coach have recently been dropped. Meanwhile, Larry Sanders is also seen weeknights on VH-1 Classic. The show takes viewers behind the scenes of Sanders' late-night talk show revealing the comedic misadventures among the show's creators, crew and celebrity guests. 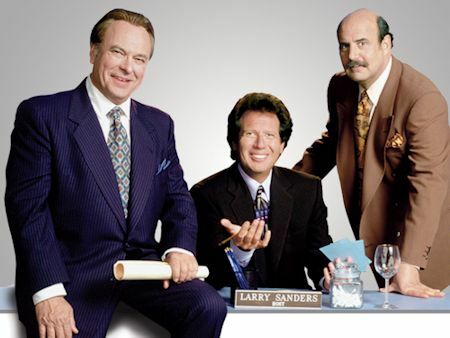 The Larry Sanders Show stars Garry Shandling as host Larry Sanders and Jeffrey Tambor (Arrested Development) as his sidekick Hank. 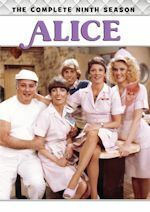 The show also stars Rip Torn as the show's executive producer, Artie, Penny Johnson as Sanders' assistant Beverly, Wallace Langham as the show's head writer Phil and Janeane Garofalo as talent booker Paula. The Larry Sanders Show rivaled its real life late-night counterparts in many respects with guest lineups featuring the biggest names in entertainment including Jennifer Aniston, Adam Sandler, Sally Field, Alec Baldwin, Billy Crystal, Jerry Seinfeld, William Shatner, Greg Kinnear, Jeff Goldblum, David Duchovny, Burt Reynolds, Bob Costas, Sarah Jessica Parker, Sharon Stone, Robin Williams, Rob Lowe, Courtney Cox, Julianna Margulies, Mandy Patinkin, Rosie O'Donnell, Nicollette Sheridan, Vince Vaughn, Suzanne Somers, Jim Belushi, Sting, Heidi Klum, Jerry Stiller, Drew Barrymore, Terry Bradshaw, John Ritter and many others. In addition to actors and athletes, viewers will recognize a number of their favorite TV luminaries who portrayed themselves on the show including David Letterman, Jon Stewart, Bill Maher, Ellen DeGeneres, Regis Philbin, Carol Burnett, Larry King, Sarah Silverman, Howard Stern, Alex Trebek and REELZ' own Sam Rubin. Stay with us for further updates on REELZ! Fox's Tuesday adorkable sitcom starring Zooey Deschanel airs Tuesday nights at 9:00pm and we have just watched the next episode that airs tonight (Feb. 5). And we continue where we left off last week in "Cooler!" In the episode airing tonight, "Table 34," Jess (Zooey Deschanel) and Nick (Jake Johnson) both are reeling from their passionate late-night kiss. 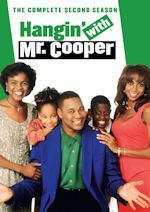 Unsure of her feelings and what the kiss meant, Jess spends the day with Cece (Hannah Simone) at an East Indian marriage convention. 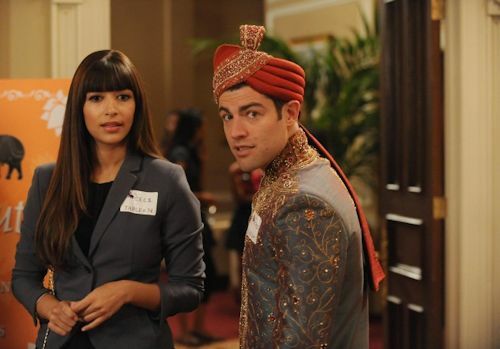 Seeking to escape his own conflicted feelings, Nick offers to help Schmidt (Max Greenfield) at another attempt to win back Cece, unknowingly putting himself directly in Jess' sightlines. This episode is on par with last week. There are some serious moments, but there are also many funny lines and scenes at the convention. There is a nice mix of pop culture references from movies and physical comedy, including Nick's panic moonwalking. Like last week's episode, it ends with a big story development. Will sparks fly again? Tune in tonight to find out. 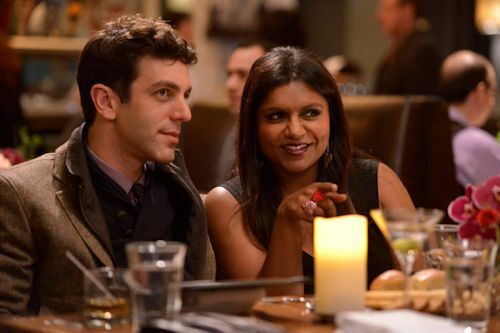 Fox's Tuesday night comedy starring Mindy Kaling airs Tuesday nights at 9:30pm immediately following New Girl and we have just watched the next episode that airs tonight (Feb. 5). Can men and women really be just friends? Dr. Mindy Lahiri (Mindy Kaling) attempts to find the answer to this age-old question. In the episode airing tonight, "Harry & Mindy," Mindy tries to solve Jaime's (guest star BJ Novak) best friend problem by pairing up Lucy (guest star Eva Amurri Martino) with Danny (Chris Messina) on a Valentine's Day double date. Meanwhile, Jeremy (Ed Weeks) helps Morgan (Ike Barinholtz) with his pickup skills. The Mindy Project continues to march through the first season, and seems to be working on trying to figure out exactly what it is... much like Mindy's own character. The series continues to have high points and low points, but each time I watch it, I feel that it is slowly getting to a point where it is consistently good. It would be nice if we do see more of Novak after this episode, but only time will tell if and how much of his character we'll see (right now, it doesn't appear that there are any future plans). Fans of The Office should be watching this show, especially this particular episode.